Website design is big business. There are around 5.2 million small businesses in the UK and 20 million in the EU, most of who need a website. Early in the life of most small businesses, someone is going to ask the question ‘How do I get a website built?’ Some small businesses will build their own website (and there are lots of website design software packages available to facilitate this), but the majority will need to employ a website design company (probably another small business) to do this for them. And it’s often not quite as simple as just building a website. Many fledgling businesses will also be looking for a digital marketing strategy, linking their website to social media and e-mail campaigns and will want to be as close to the top of the Google search listings as possible. Do you want your website to sell your business? Is an on-line brochure with contact details enough for what you need? Alternatively, do you want a site that really sells you and what you do? Something that stands out from the crowd and draws customers in? Do you want the site to be interactive? e.g. include questionnaires, calculators, animations etc. How dynamic do you want the site to be? Are you launching new products all of the time or changing what you offer or is most of the content going to be static? Does your site need to fulfil a support function too? Now you need to write down exactly what you want. This feels like a really difficult question to start with, ‘I want a website for my business, what more do these guys need to know?’ but once you get started it will get easier. How do you want your home page to look? g. mainly text or lots of white space, striking images, moving images etc. What do you want to tell customers about your business or about you on your home page? This page says a lot about the image of your company. Do you want to look young and dynamic, stable and secure, serious and businesslike, humorous, different from everyone else? What parts of your business do you want to hit your customers between the eyes with, on the home page? What about your contact details? Telephone number(s), e-mail address, postal address, links to social media Twitter, Facebook, Google + etc. Do you want a call to action or an invitation to sign up to your e-mail list or blog? What images do you want, do you want videos? If you have an image in your head of how you’d like your home page to look, then get a mock up together using a tool like Word, PowerPoint or Visio, otherwise try to describe what you want in a series of one line statements. How fast will the website respond? Is the website mobile friendly and will it be regarded so by Google – depending on whose report you read, we traffic from mobile devices now accounts for 50-60% of all web traffic – so this is important. What back-up and disaster recovery facility will the website design company provide? Website design costs could be anything from £500 for a brochure site, built off a template, which will look a lot like all of the other sites built off that template, to several thousand pounds for a fast, slick looking and unique website. It also depends how many pages you need on the site and what you want to use the site for. If you just want an unspectacular presence on the web, with only a few pages that show what you can do, but without it being any real focus of your marketing then you should be able to achieve this for less than £500. If you want to use the site to really sell your business, then you’re going to need to spend an absolute minimum of £2,000. I strongly advise that you document your requirements before asking for quotes. Without this how are your web designers going to know what you want? Getting a quote from a verbal briefing is really quite dangerous. Once you actually start working with your Web Designer and spending money, you may well find out that there is no common understanding of what was in the price they quoted you and as a result costs will start to escalate. If you’re in the market to spend less than £2,000 then you should document your requirements in word or excel and then start contacting website designers ( just google ‘website designer’) and ask them to quote against your requirements. If you can spend more than that, then I would recommend that you get a more formal Request for Quotation together and ask suppliers to quote against that. You need to qualify the numbers of potential suppliers down, but I have found in this market, because there is so much easy work out there for Web Designers, many can’t be bothered to reply to a tender or even a requirements document, so you may need to send your document out to quite a few. There are a growing number of portals around the web, where you can post your requirement and sit back and wait for the bids to come in and this may be a better way for you to go. This tendering process should give you an idea of how easy it’s going to be to deal with each supplier. If they can’t be bothered to read and respond to your document when they want your business, just think what they’ll be like when they’ve won it. Talk to everyone who you are considering employing. Don’t take someone on, on the basis of an e-mail interchange. If you believe that outsourcing your website build means you can sit back and wait for a shiny new website to appear a few weeks later, then think again! You are going to have to spend time on this too. You are likely to have to agree a number of proofs. 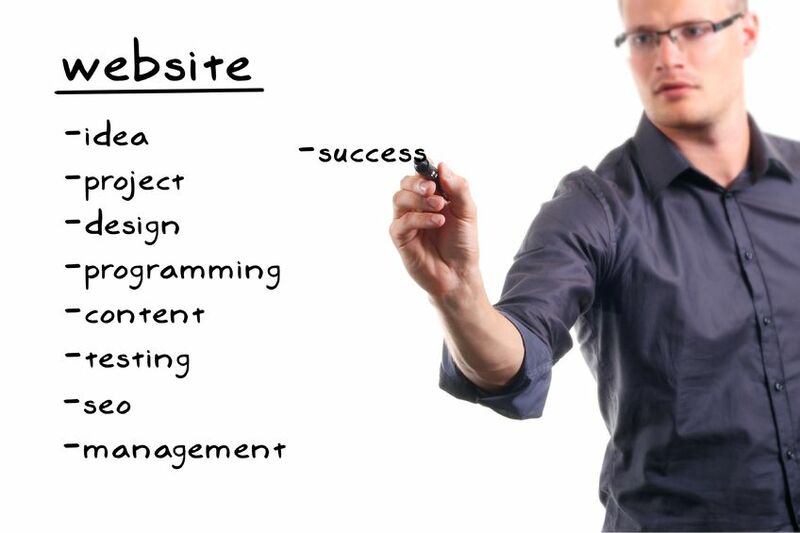 Most Website Designers will produce your website in a number of iterations, until they get it to what you want. You’re also going to need to produce copy and probably images too. Some website designers will proof read the copy for you, but you’re the expert in your business, so you will need to produce it. You’re also going to need to test what is delivered before you agree that the build is complete. As you can probably ascertain from this post, getting a website that really promotes your business and is what you want at a price you want isn’t quite as simple as finding a few names in the Yellow Pages and hoping for the best. It would probably take a book to cover everything that could be involved in having a website designed and built, but hopefully there is enough here to set you on the right path. Gren Gale is a Project Management and Procurement Consultant who has helped organisations select and implement their website. He is the author of Project Management for SMEs and owner of PM Results.